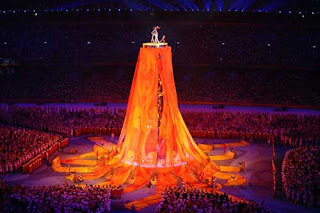 My favorite part in the closing ceremony was the number done by the acrobats. They were strewn on the memory tower and did all kinds of acrobatic acts that were not for the faint-hearted. The memory tower turned into the Beijing Olympic Torch and it was indeed a site to behold. The Beijing Olympics, with its ups and downs, was a one great event grandiously planned and executed. Kudos!